Winter is a terrifying time for millions of vulnerable people around the world. Harsh temperatures plunge many into poverty and cold, at risk of illness and malnutrition. There are currently 13.5 million people in need of humanitarian aid. 4.5 million of these are in besieged and hard to reach areas. Thousands have been displaced and are in desperate need of help. These people have lost their families, homes and everything they own. Without adequate shelter from the elements, basic sanitation or food, they remain in grave danger as the winter draws in. We are working to provide these people with the help they need to survive and stay well. We work tirelessly to treat and evacuate the wounded and sick and provide food, shelter and sanitation. However, due to the rising costs of basic items, we need your help more than ever to keep these people alive and safe. Providing life-saving fuel to heat homes and shelters throughout the whole of winter. Distributing basic hygiene kits including sanitary and medical supplies. Delivering winter protection clothing to keep people warm. Offering essential food packs to feed the hungry. Helping those in need, wherever they may be. You can help us to provide relief around the world this winter. Our programmes deliver life-saving aid to Yemen, Jordan, Lebanon, Gaza, Pakistan, Bangladesh, India, Iraq, Bosnia and beyond. Over £1.2 million spent on emergency shelters, warm clothing and winter kits. 30 global project interventions helping those affected by extreme weather conditions. Helping those at home in the UK. We’ve been helping the elderly and homeless every winter since 2011 as one of the first Muslim NGOs to respond to the threat of winter. Installing radiator reflectors and draught excluders for the elderly and vulnerable. Providing practical items and advice on how to keep warm with our Winter Kits. Supplying free ice grips for shoes and walking sticks to enable the elderly to stay active and independent. Distributing food and other essential items to those surviving on the streets through our Rucksack Challenge. 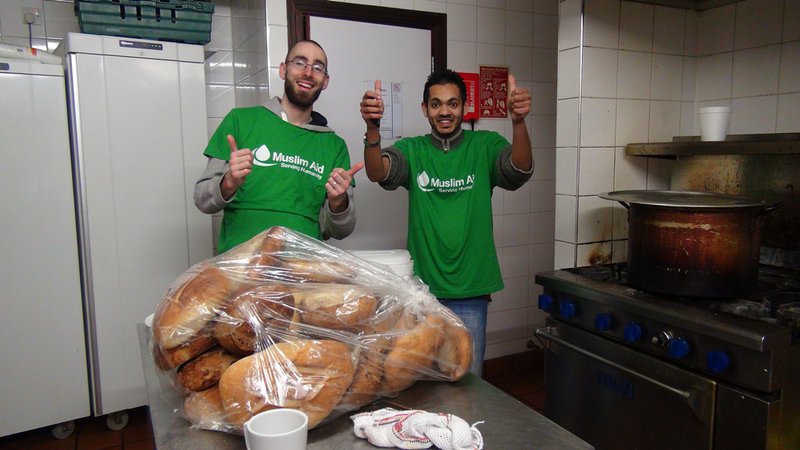 Feeding the hungry with our Food Harvest programme through food banks and soup kitchens. £50 Provides a live saving ‘keep warm kit’ for the Homeless and elderly in the UK. Support our Winter Campaign and help Warm a Heart This Winter. For £100, provides warmth and food for a family. For £250, provides emergency healthcare treatments. Join our exciting Rucksack Challenge! This contains essential items, including gloves, a hat, socks, a sleeping bag, a blanket, and thermal garments to be given to an elderly or homeless person (some items vary depending on the individual's living situation). Keeps a family alive by providing warmth and food to the war torn, poor and destitute around the world. Provides Emergency healthcare treatments to the most vulnerable during these cold winter months.